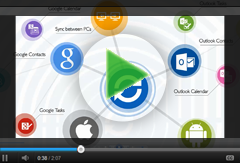 Sync Outlook with iPhone or iPad using Sync2. Sync iPhone with Microsoft Outlook Contacts and Calendar. Sync Outlook Contacts with iPhone, iPad and iPod. Sync Outlook with iPhone, sync Outlook with iPad, iPod using Google Contacts. If you have an iPhone or iPad but you've been using Microsoft Outlook for years and already have your Contacts just the way you want it, Sync2 can help you synchronize the information via Google services. Sync Gmail Contacts with Outlook contacts and access Outlook information through the web. After you have it on Google, just synchronize it with your iPhone or iPad. Sync Outlook Calendar with iPhone, iPad and iPod. Use Sync2 to sync Google Calendar with Outlook and access Outlook information through the Google service. The program will automatically download-upload and synchronize updates from the Google Calendar service even if your Outlook is closed. Sync2 can be used for Outlook synchronization on-demand, at scheduled times or continuously. Sync selected Outlook calendar with shared Google account to share your events with others. After you have it on Google, just synchronize it with your iPhone or iPad.